Sumelic thought /nl/ would be disfavored for the same reason /dl/ is disfavored (/d/ and /l/ are both alveolar, and so is /n/), and I thought /nl/ would be even more disfavored than /dl/ (because /n/ and /l/ are both sonorants while /d/ is a stop). /ui/, /uɑ/, /uɛ/, /ua/, /iu/, /iɛ/, /ia/, /ɑi/, /ɛu/, /ɛi/, /au/, /ai/, and /aɛ/. Sorry, what I said wasn't quite accurate. Sumelic proposed a sound change of /nl/ > /dl/ but wasn't sure if that would work since clusters like /dl/ tend to be disfavored (since /d/ and /l/ have the same place of articulation). I thought that /nl/ would be disfavored for the same reason, perhaps even more disfavored since /n/ and /l/ have more similar manners of articulation than /d/ and /l/. Are /ui uɑ uɛ ua iu iɛ ia/ rising or falling? /uɑ̯/ is different from /u̯ɑ/. A "rising" diphthong is one where the main vowel, the "nucleus" of the syllable, comes second, and the first vowel is just a non-syllabic glide into the second. The [ju] in English "beauty" could be analyzed as a rising diphthong /iu/. A "falling" diphthong is like the /aɪ/ in English "eye." The first vowel is the nucleus of the syllable, and the second vowel is a non-syllabic glide. Basically, if your /ui/ is rising, it will sound similar or identical to [wi], and if it's falling, it will sound similar or identical to [uj]. Sumelic wrote: A "rising" diphthong is one where the main vowel, the "nucleus" of the syllable, comes second, and the first vowel is just a non-syllabic glide into the second. The [ju] in English "beauty" could be analyzed as a rising diphthong /iu/. the simple answer then is both, i'll have both in my language. You should specify which are which, then. GrandPiano wrote: You should specify which are which, then. agreed. what if I just took out /ui/ and just used /wi/ or /uj/? along with any diphthongs that started or ended with /u/ or /i/? You could do that. Whether you transcribe a sound as /wi/ or /u̯i/ often depends more on how the sounds fit into the language's sound system than on their phonetic properties. For example, if a language shows a pattern of affixation like [tap] + /i/ = [taˈpi], [tu] + /i/ = [twi], it may make sense to analyze diphthongs as underlyingly being sequences of two vowels. This kind of pattern occurs in French, although there are some complications that make the phonemic status of onglides/rising diphthongs more unclear in that language. 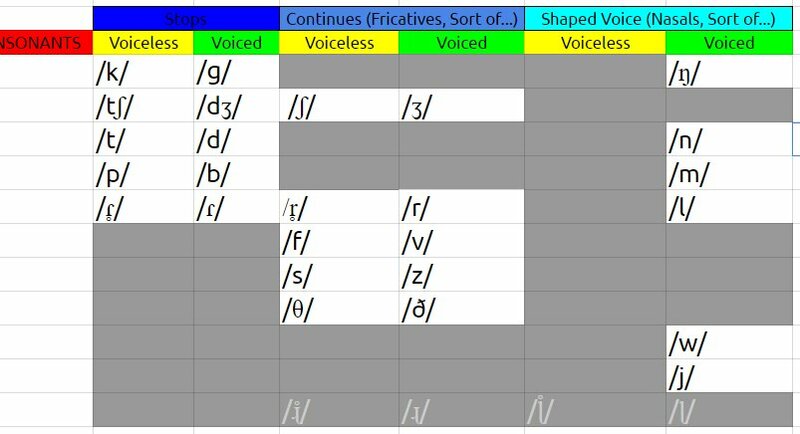 On the other hand, sometimes parts of phonetic diphthongs seem to pattern like consonants. For example, in English, words starting with /ju/, which does act like a diphthong in some ways, are nonetheless preceded by the pre-consonantal "a" form of the indefinite article rather than the pre-vocalic "an" form. This supports an analysis where /ju/ starts out with a consonantal element /j/ rather than a vowel element /i/. It's not very clear-cut: often diphthongs show conflicting tendencies or behave ambiguously. Sumelic wrote: You could do that. Whether you transcribe a sound as /wi/ or /u̯i/ often depends more on how the sounds fit into the language's sound system than on their phonetic properties. Yeah, i'll just replace all of those with /w/ and /j/. Can't /ɛu/ be analyzed as /ɛw/? Sumelic wrote: Can't /ɛu/ be analyzed as /ɛw/? I would wonder if it is even worth keeping just that around consider the distance between the two is so small and you have both the phonemes on their own but stranger things have happened and it is a artistic choice. Nachtuil wrote: I would wonder if it is even worth keeping just that around consider the distance between the two is so small and you have both the phonemes on their own but stranger things have happened and it is a artistic choice. I might as well just keep it so I have one if any, you know? 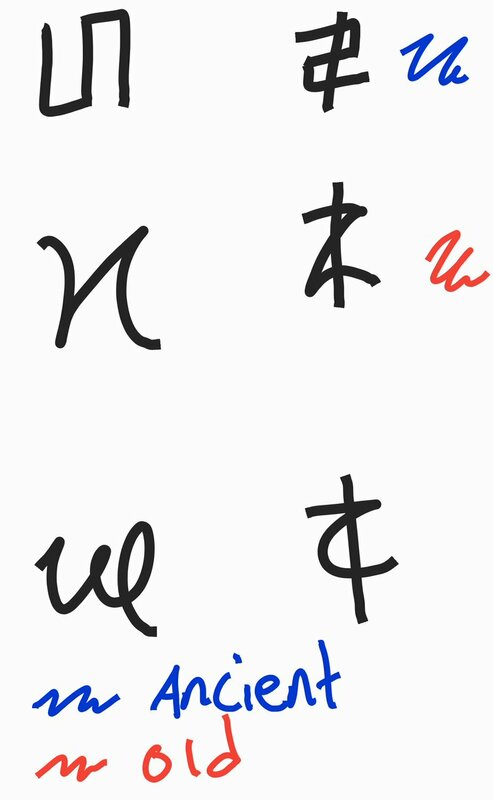 I created a writing system for my language, and at first I was very proud of myself, but then I looked at it and was unhappy with it. Tell me what you think? doesn't it just look a bit weird? 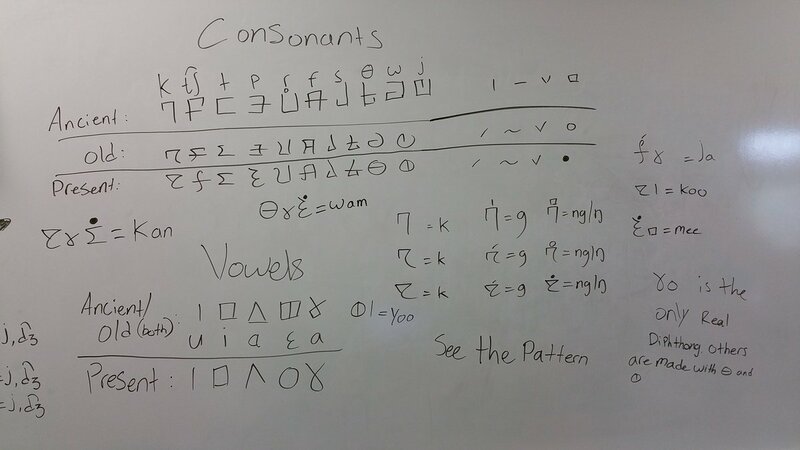 Each symbol corresponds to one row on my Phonetic Chart. The two symbols that I particularly Dislike are the symbols that stand for /s/ and /θ/. I was thinking of replacing the characters for /s/ and /θ/ with these two. the ancient is on top and the rest is self explanatory.